Just a day after posting the first look at Opera 12 on Ghacks the Opera team decided to release the alpha version of the browser publicly. The review the other day was based on the latest snapshot release, and while changes between that latest snapshot of Opera and the alpha are scarce it justifies a second deeper look at the upcoming version of the Opera web browser. I ran Opera 12 Alpha through a series of tests and boy did the new version manage to impress. 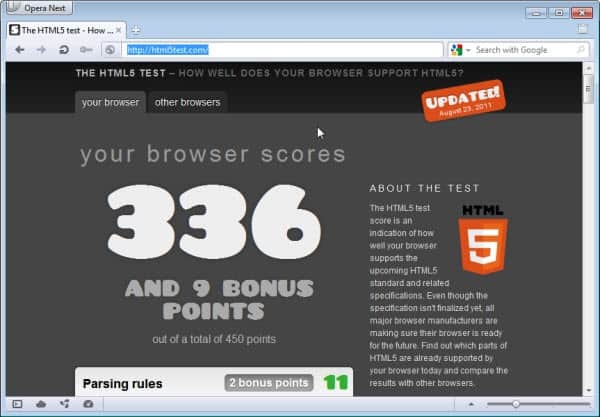 Opera 12 Alpha scored 336 points and 9 bonus points in the HTML5 test, that's more than Firefox's 314+9 and a lot more than Microsoft Internet Explorer 9's 141+5. Only Google Chrome Dev managed to beat Opera by 8 standard points and 6 bonus points. Opera still trails behind in the Peacekeeper benchmark when compared to the most recent Chrome Dev version, at least on a fairly standard Intel Core i7 system running Windows 7 Professional (Ghacks reader Matthew mailed me on the other hand stating that Opera beat Chromes run by nearly a factor of 2. Then again, he failed to mention the Chrome version tested). This version of Opera has full hardware acceleration support. The browser is set to auto detect hardware acceleration capabilities of the graphics card. Opera notes that support works best if graphics card drivers are the most recent and that users may experience bugs in the alpha release. Users who want to disable - or force - full hardware acceleration support in the browser need to open opera:config in the browser and filter for EnableHardwareAcceleration to disable (0), auto-detect (1) or force (2) hardware acceleration in the browser. Similar settings are available for the WebGL. Users need to filter for EnableWebGL to turn it off (0), auto-detect (1) or force on (2) the technology. You can check if hardware acceleration is enabled in your version of Opera by loading the opera:gpu page in the web browser. If you see Vega backend: Software it is not enabled. Hardware acceleration uses a OpenGL backend currently. Opera has announced that support for DirectX will be implemented at a later time in the browser. The developers have added new personalization features to the browser. Skins have been renamed as themes, and you can download and install a few on the official Opera themes page. Interested users can download Opera 12 Alpha for all supported operating systems from the Opera Desktop Team blog. Why do you got 336+9 bonus points? I tested it with the default settings. Yes, you did right Martin. Html5test.com should really be updated. WebSockets protocol has been updated though html5test.com still gives points to browsers supporting a really old version. Hi, is hardware acceleration available also under Windows XP? So far Opera is the only browser I’ve read about providing hardware acceleration for XP. Whoops, ok. Didn’t know it did. Kind of followed the news regarding FF, gave FF 4.0 a short try but for quite some time now SRWare Iron has taken the spot as my 2nd browser, replacing FF. I liked the old FF 2.x and some of the 3.x versions; current ones…. not really. rotating in a framed setting. There may have been 15 or more widgets rotating in this frame. I see no reference to it in Opera 11.52. Is it in the latest Opera? Or have you seen it, or know if it can be downloaded for use on Opera 11.52? PS… I am currently search Opera links on Google, and hope I may come across it soon!